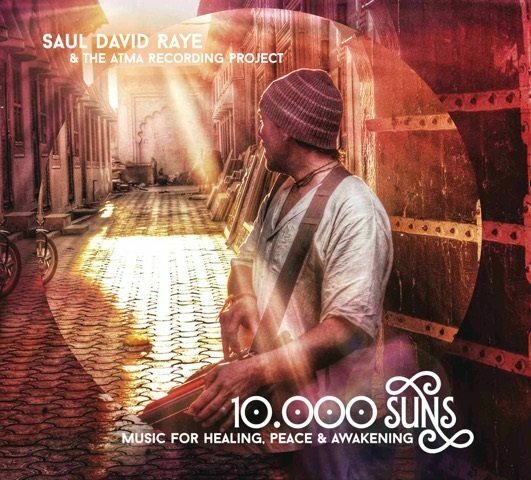 A New Music Release from Saul David Raye & The Atma Recording Project ! Featuring Jim Beckwith, Ben Leinbach, Calia Marshall, Chase Nichter, Ananda Yogiji, Marla Leigh Goldstein, David Watts, Manohar Gurung and more. The song was inspired by the 2015 Nepal earthquake. It has an uplifting message of unity, and is a prayer for all sentient beings to live in freedom and peace. It is dedicated to the compassionate Spirit of the Nepali People. We recorded this last year while in Nepal. 2) Please share with your friends. 3) You can donate directly to Ramana’s Garden or One Heart Wordwide, two of my favorite charities. 4) If you would like to help us cover the costs of the song production and its video, which we are in the process of editing, please donate to our GoFundMe campaign. Some friends have already supported us, but many of the costs have been out of pocket. We are happy to have done it, but every little bit helps. All proceeds benefit two charities working directly with the Nepali people. For more info and to make a donation directly, visit Ramana’s Garden Children’s Home and One Heart World-Wide. ~ To Jim Beckwith for your time, talent, trust and LOVE to bring this fruition. ~ To all the musicians who donated their talent and time to making this recording. ~ To Manohar Gurung for helping us to land in Nepal, guiding us in the right direction, and your constant support. ~ To Deva Dwabha and all the beautiful children and family at Ramana’s Garden. Your amazing work and love-in-action inspired us to complete this project. ~ To One Heart Worldwide for the amazing work you are doing in the villages of Nepal to save lives. ~ To Chetan Raj Karki and Anu Kadka for hosting us in Nepal, bringing us into home and hearts, and helping us manifest this project. ~ To Stefan Heger for mastering the project and your support of the music. ~ To Calia Marshall and Chase Nichter for making the journey and adding your talent and love to this project. ~ To our supporters: Talia Jaya Arica, Deb George, Janet Marshall, Barbara Conyer, Heather Albright, Claudia Castor and Chinnamasta Stiles. Thank you for your support of this project! ~ To Sridhar Silberfein and the Bhaktifest family for all your support, connections and inspiration. ~ To Katrina Gustafson, Michael Gustafson and the Karma Yoga family for re-igniting the project. ~ To Kat Tudor for your support and love on many planes. ~ Thanks to the Mandala family. ~ To Natalie Bell for all your hard work, support and care over these last years, and helping this to manifest. ~ To my family for your love and support. ~ And special thanks to everyone who has supported the music. We are grateful. Ananda Kirtan is a soulful experience of ecstatic music, chanting, dancing, meditation and prayer that creates a space for connection, celebration and overflowing LOVE!Experience the powerful unifying and healing vibrations of the practice of Kirtan. Kirtan is the devotional singing from the Bhakti (Yoga of the Heart) tradition of India, done in an ecstatic and meditative call and response style. Singing and dancing have long been sacred healing practices to awaken the life force, connect us to spirit and embody an ecstatic connection to the Divine force that sustains all life. Ananda Kirtan is a moving, ecstatic, expansive and raw experience that dives deep into the nectar of the heart. AUM NAMAH SIVAYA / JAI MA ! To find 10,000 Suns CD, click here.